Read on for my thoughts about growing your own and saving money.And maybe just help the planet while you are at it! First day of the new year (well Gregorian calendar anyway!) , beautiful sunny day as I write this, and I am laid up with Plantar Fasciitis in my right foot! Now, although that does sound like it could be an ideal flower to grow in a hanging basket (! ), it basically means I have strained the skin/muscle that is between my heel and my toes, and it is too painful to walk anywhere if I try to put pressure on it. 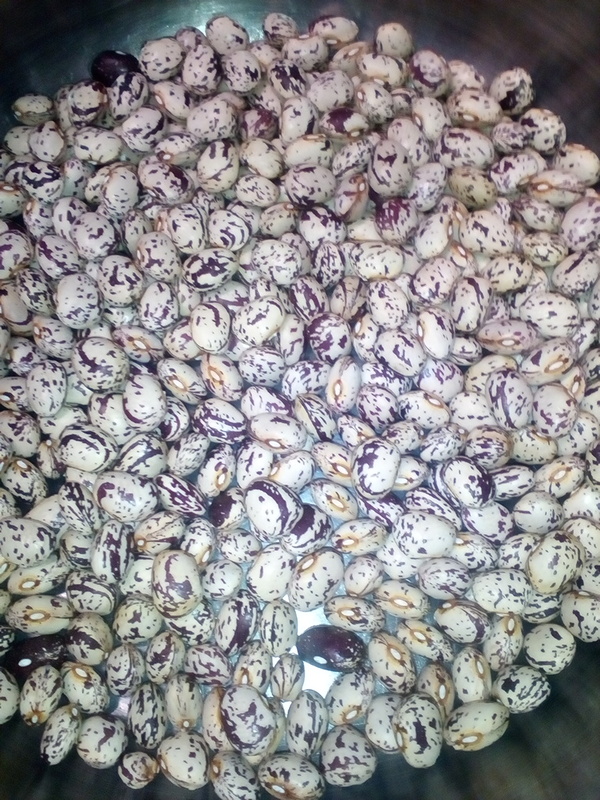 So, a trip to the allotment is out of the question, possibly for the next few days, but my thoughts are already turning to the new season and what to grow in the coming year. 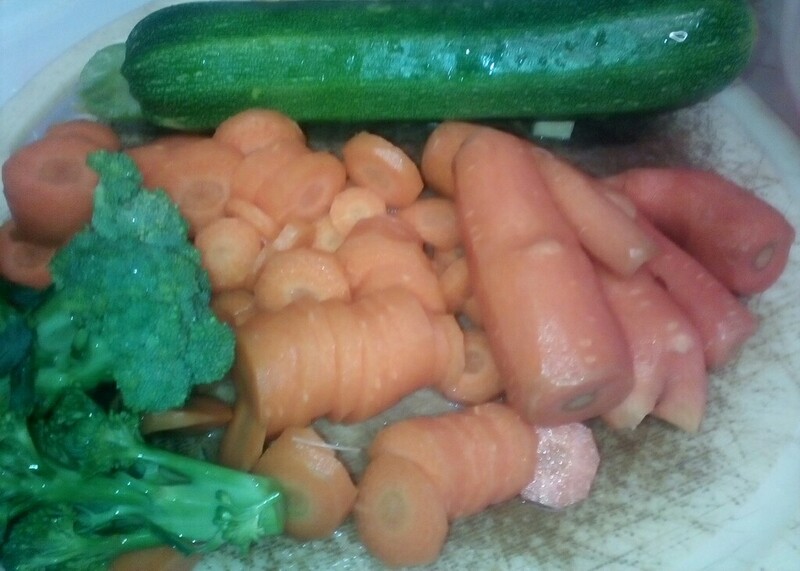 That being said, the allotment is still productive with sprouts, parsnips and leeks there for the eating! In store there's onions and garlic hanging up, apples in the shed, and in the cupboards pumpkin chutney, pickled courgettes and gherkins, and a large collection of various jams. And there's the amazing long lived tomato plant, which gave us 3 fresh home grown tomatoes on Boxing Day! We even had three peppers in December from the outdoor lean-to greenhouse! 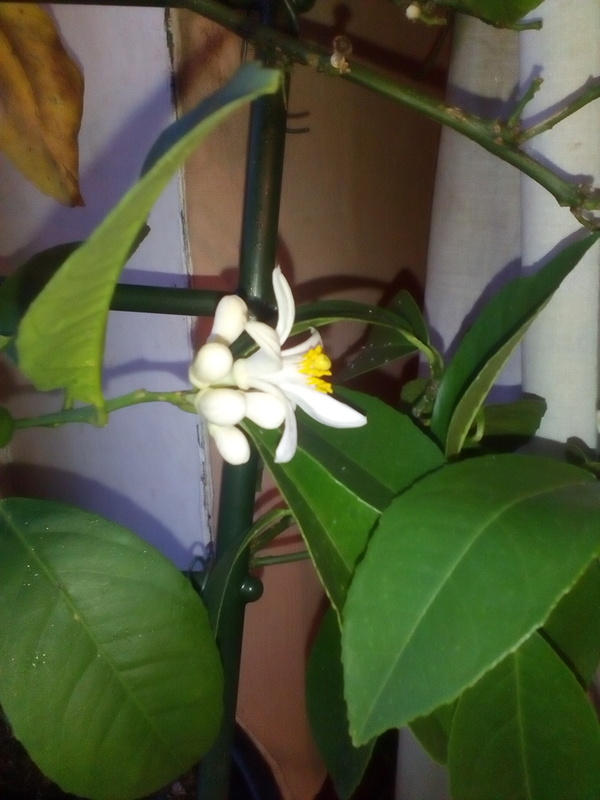 The Meyer lemon tree is flowering, I think it is a bit confused as it was brought inside in early November so with the warmth in the house it probably thinks it is Spring now! There's still one remaining lemon on it as well! 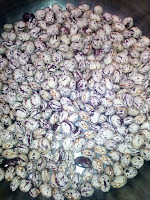 Borlotti beans - grown up an old swing frame they have produced lots of these rather pretty and indeed very tasty beans! Gherkins - never grown these before and three plants were intensely prolific in the lean to greenhouse at the front of the house. Really nice on cheese sandwiches or indeed as an accompaniment to burgers and other meat dishes. Carrots - grown in tyre stacks these are still giving us carrots despite the snow and frost - the tyres act as insulators and raise the carrots well above the ground - which also helps with controlling carrot flies. 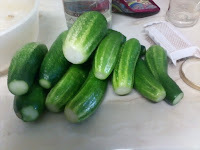 The courgettes were prolific (as is their modus operandi!) and the calebrese did well too. The peas - very few peas this year, I think this is a problem other people have had. 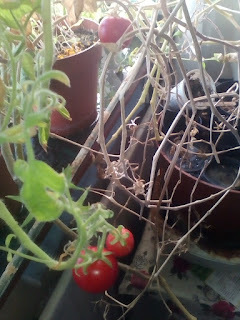 Potatoes - whilst we have had home grown potatoes from late July until December, they haven't been that big, and blight was a problem for some of them. A good year for us means home grown potatoes until February. Just in time for Christmas I bottled some parsnip wine that has been sitting maturing in a bedroom for some considerable time (I think it was started about 2 years or more ago!). However, it does benefit from aging and indeed the first bottle of this tasted was quite a sweet wine and indeed quite clear. 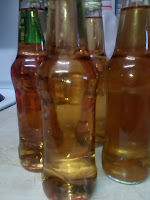 It is strong stuff, hence using the smaller bottles! Has Michael Gove had a "Road to Damascus" moment? First pepper of the year! My Favourite Links to other allotment and money saving sites! All material is Copyright Michelle Smart 2018. Please contact me if you wish to use commercially. Simple theme. Theme images by Xaviarnau. Powered by Blogger.